Dear Mr. President: To fix NCLB, you must first understand the skills that matter most in the 21st century and the ways in which the NCLB law is actually getting in the way of more meaningful accountability. And then you must invest in accountability "version 2.0." Your education platform was filled with noble generalities. I suppose you thought you couldn't get more specific because the No Child Left Behind law is increasingly unpopular and unworkable, and there is no agreement about how to fix it. It is an issue that doesn't lend itself to sound bites. To fix NCLB, you must first understand the skills that matter most in the 21st century and the ways in which the NCLB law is actually getting in the way of more meaningful accountability. And then you must invest in accountability "version 2.0." Problem: Too few students are graduating from high school. The ones who do lack the essential skills they need for college, careers, and citizenship. Nearly one third of our students do not graduate from high school. This problem is not more widely known because states are not held accountable for improving their graduation rates. Additionally, states use different formulas for calculating their districts' high school graduation rates, and almost all of them significantly overstate the numbers of students who graduate. Florida, for example, claims a seventy percent graduation rate, but the reality is closer to fifty-five percent. The majority of the students who do graduate from our nation's public high schools are unprepared for college and the workplace. In the 21st century, the skills needed for careers, college, and citizenship have converged: Critical thinking, creative problem-solving, collaboration, and effective communication have become far more important than mere memorization and factual recall. However, at the high school level, states continue to test low level content knowledge and factual recall through multiple choice tests, and a passing score in even the most "rigorous" of these tests, such as the Massachusetts MCAS test, does not mean students are career and college-ready. Forty percent of the students who pass MCAS need remediation in college. Nationally, one out of every two students who starts college never completes a degree, and the main reason for this poor completion rate is students' lack of college-level skills, not lack of subject content knowledge. Similarity, employers complain that most new employees lack proficiency in the "new basic" skills outlined above. Solution: The Department of Education should hold schools and districts accountable for their graduation rates and assess the skills that matter most. The Department of Education should require all school districts and states in the U.S. to report their high school graduation rates according to a common formula. To ensure that schools teach the skills that matter most, the Department of Education should "audit" school districts' performance by testing representative sample populations of students with assessments that measure the most important skills. For example, the College and Work Readiness Assessment measures high school students' analytic reasoning, critical thinking, problem-solving, and writing skills and compares them to the scores of freshmen in 250 colleges. (www.cae.org). Scores from tests like these will tell us whether our country is making progress in increasing the percentages of students who leave high school "college and work ready." Scores of subgroups of students would be reported, as they are under the current law, to ensure that districts teach all students new skills. To create greater accountability, the Department of Education should issue and widely publicize an annual "report card" for every school district in the country. This short document would simply report the percent of students who graduate and the percent who graduate college-ready by subgroup. Transparency is a far more powerful way to create greater accountability than are the largely meaningless threats in the current law. States would then have the responsibility to develop strategies for helping their under-performing districts to improve. Problem: The accountability measurements for Adequate Yearly Progress incents states and districts to create a boring, dumbed-down, test prep curriculum, and there is no common standard for "proficient." One major problem with the NCLB law is the unrealistic expectation that every school will improve the number of students who score "proficient" by a certain percent every year until 100 percent of the students in the nation are proficient by 2014. 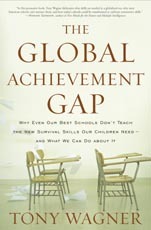 This expectation leads to two widespread practices: 1) Many states, like Mississippi and Wisconsin, create easy tests where the standard of "proficiency" is such a low bar that most students can pass; 2) To ensure that more students pass state tests, districts require teachers to teach the test content and give frequent practice tests, leaving no time for more interesting or enriching learning opportunities. Increasingly in this country, what gets tested is all that gets taught. The second major problem with the law is that it allows the standard of "proficiency" to be set by each state. So there are, in fact, fifty different standards of proficiency in this country. For example, students in Mississippi, who have traditionally been among the least literate in this country, are more "proficient" in reading than students in Minnesota, according to the two states' test scores. Because the states' standards vary so widely, their test scores tell us absolutely nothing about what students really know and can do. Solution: Create a national high school writing test, benchmark districts' and states' yearly progress to a common international standard, and make the unit of accountability the district, rather than individual students. Lack of writing skills is the number one complaint of both employers and college teachers. However, many states are no longer testing writing because they are not required to, and writing tests are expensive and time-consuming to score. To the extent that some states, like Massachusetts, test students' writing, it is by requiring high school students merely to write a five paragraph essay. The solution is for the federal government to administer a two hour writing exam to demographic sample populations of eleventh graders in all states, as is done in many European countries. The essay question for the writing exam would be based on a major event or document in American History. For example: "Discuss the causes of the civil war and the ways in which these causes continue to influence current events in this country;" Or, "Which of the first ten amendments (which would be reproduced on the test) do you think is most important for a strong democracy and why." The second solution to the lack of common standards is to use the Program for International Student Assessment (PISA) test results as the benchmark for progress in states' education improvement efforts. American students are significantly outperformed by students in most other industrial nations, in part because the PISA tests require very little recall of information and much more application of knowledge to new problems. These are the skills that matter most in the real world, but they are not ones our students learn in their multiple choice world. The incentive for states to improve their education outcomes is economic. States and school communities that have very low PISA scores, which would be widely publicized by the Department of Education, will not attract or keep businesses that demand all employees have 21st century skills. Finally, in order for states to be able to afford much higher quality tests, like the CWRA and PISA, they should no longer be required to test every student every year. State and district accountability can be achieved by testing sample populations of students every year -- a kind of educational audit. To do well on such tests, districts and schools would need to create local assessments for every student that were aligned with the new state and national tests. Each teacher would be regularly assessing all of his or her students to ensure that students who might be among those randomly chosen for the state and national tests would be well-prepared. Accountability 2.0 would focus schools and districts on preparing students for meaningful assessments which measure the skills that matter most in the 21st century. To prepare for these new tests, all students would be taught how to write, reason, analyze, pose thoughtful questions and solve problems. In short, they would learn the skills they need for college, careers, and citizenship, and they would be engaged in challenging and interesting work in their classes. Doing anything less that a version 2.0 of our accountability system puts our students' and our country's future at stake.